A major novel -- the first since East of Eden -- this brings into focus a conflict within a man's personality which will have wide, perhaps too wide, recognition value. John Steinbeck's special gift of compassion might have turned this into a sentimental exercise. As it develops, however, this is a taut, realistic, controversial portrait of Ethan Allen Hawley, scion of an old family, bearing his heritage of high ideals, intrinsic honesty -- and fear of insecurity, while confronted with a shattered fortune- the old homestead the only thing left, and a job as grocery clerk in a store he had once owned. The pressures on him come to a head in this winter of his discontent, as his wife (who is basically an ideal mate, sensitive, perceptive, loving) lashes out at him for not giving his family the wherewithal to support their name; his son and daughter chide him for his failures -- and a tiny inheritance of his wife, Mary, offers a possible loophole for taking a long chance. And then he is shown a way -- involving a compromise with his integrity, a betrayal of his standards-and he succumbs, actually going beyond the initial opportunity to trap two men to whom he owes affection and loyalty. What happens is not wholly within the accepted pattern -- nor is the outcome predictable. 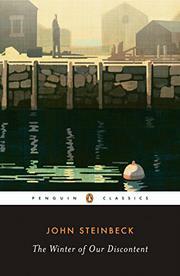 But Steinbeck sustains the reader's suspense, poses issues of responsibility -- a man to his friend, to his employer, to his son, to himself -- and leaves the resolution in final analysis to the reader. It is a fascinating and disturbing book, uncomfortably close to the challenge the average man faces in today's materialistic world.